The Aqua-Jet® surface mechanical aerator, manufactured by Aqua-Aerobic Systems, has been approved by Underwriters Laboratory (UL) to meet ANSI/NSF STANDARD 61 requirements for use in potable water applications. The approval includes seven horsepower sizes from 1 through 15. These units are designated as model SS-PW and can be utilized for TTHM stripping applications or circulation in potable water treatment systems and reservoirs with a minimum volume of 100,000 gallons. The UL approval is a result of a one-year testing program conducted by UL per ANSI/NSF 61 protocol for the use of the Aqua-Jet aerator in potable water applications. In addition, the aerator was tested for the removal of disinfection by-products (DBPs). One specific DBP tested, Total Trihalomethane (TTHM), represents a group of volatile organic compounds formed by the interaction of organic precursors in raw source water and free chlorine added for disinfection. Since the removal of organic precursors can be difficult and costly, the objective was to research a lower cost aeration solution for TTHM removal. Testing confirmed that TTHMs can be effectively removed by various methods of aeration once the reaction with chlorine takes place. 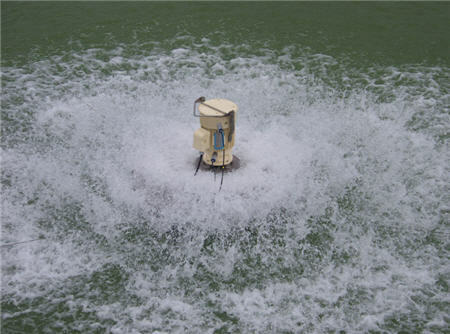 The Aqua-Jet surface mechanical aerator is one of the successful aeration methods. The Aqua-Jet aerator model SS-PW will offer substantial savings from the perspective of capital, installation and operating cost when compared to diffused, or other spray forms of aeration for TTHM stripping applications. Aqua-Aerobic has been a leader in the design and manufacture of wastewater treatment equipment and systems for both industrial and municipal markets, worldwide, since 1969. Its treatment solutions include aeration and mixing, biological processes, filtration systems, controls systems, membranes and aftermarket products. Aqua Aerobic Systems Inc. technologies meet or exceed the most stringent effluent requirements of today and are designed to accommodate changing effluent demands of tomorrow. For more information, visit www.aqua-aerobic.com.